You need new ways to scale your brand and new strategies to build your online reach. You’ve just built a website and covered some technical search-engine optimization (SEO) aspects, but organic traffic has slowed, and you’re not sure what to do next. There are so many complex ranking factors, but you don’t have time to go down that SEO rabbit hole. It’s time to allocate your resources elsewhere. Backlink building is one of the main underlying factors in your website’s ability to rank on search engines. It helps search engines categorize content that is relevant to a targeted keyword. A link’s anchor text and the relevant keywords used on a web page has an effect on your ability to rank on a search engine results page (SERP). There are simply too many ranking factors, so we choose to focus on one. Backlink building is the process of reaching out to other websites and offering your link as a beneficial addition to their page. Your link, whether it’s a video, infographic, or a resource page, must contain information that drives their goal forward. Google’s goal as a search engine is to provide the best information for every search. You’ll achieve that goal by producing quality content – while also keeping your books clean of any black hat SEO methods. Keep away from using black hat SEO techniques, e.g. buying links, because Google associates certain websites and rapid growth methods with manipulation tags that can tank SERP rankings. Valuable content that can be offered to websites as a resource for new articles and blog posts can help boost the backlink building process. You must ask people to incorporate your links into blogs and other forms of content. Some strategies offer better returns for your time than others, but all are completely free of charge – costing no more than the software and time you put into gathering the information. You don’t need to be original to become successful. Create content that works, and add more to it. Quality can come from the amount of information you offer. Assemble longer guides, with more information. Take a look at what is ranking for your search terms, and use that as a guideline for success. Your competitors have already played their hand, so you know what you’re up against. Now that you have the high ground list the word count, number of topics and overall quality of the top ranking articles, and use that as your base for composition. 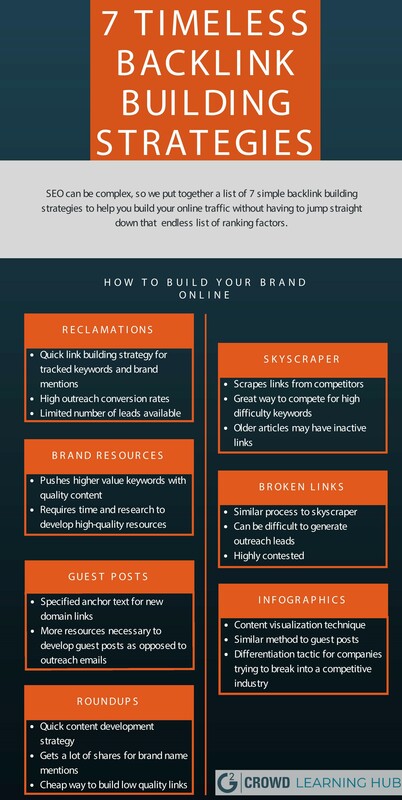 With that in mind, here are some classic backlink building strategies (with a content marketing twist) that will help you build your brand online. A keyword is a common search term that is used to find information. Search engines use many factors and algorithms to categorize web-pages and articles as related, by counting the times a certain keyword is used. Use keyword tracking tools to claim brand mentions. Your industry has relevant keywords that have a fair share of organic search volume. You and your competitors will be vying for these keywords to boost brand recognition online. Compose articles that target high traffic keywords and track them with tools like Google alerts. Google Daily Digest alerts is a free and useful tool for tracking keyword mentions. Keep the alerts insight and reach out to new blog posts and articles with your content to expand brand impact online. Competing for specific search terms can be tough. Depending on the difficulty of your keyword, the top ranking search engine results pages (SERPs) could have hundreds-to-thousands of links. If this is the case, the linking pages are a fair game. Scraping links from sites competing for top ranking pages can be a quick way to pull away some of that sweet Google juice and make it yours. SEO tools like the RankWatch link explorer detail a website backlink structure. 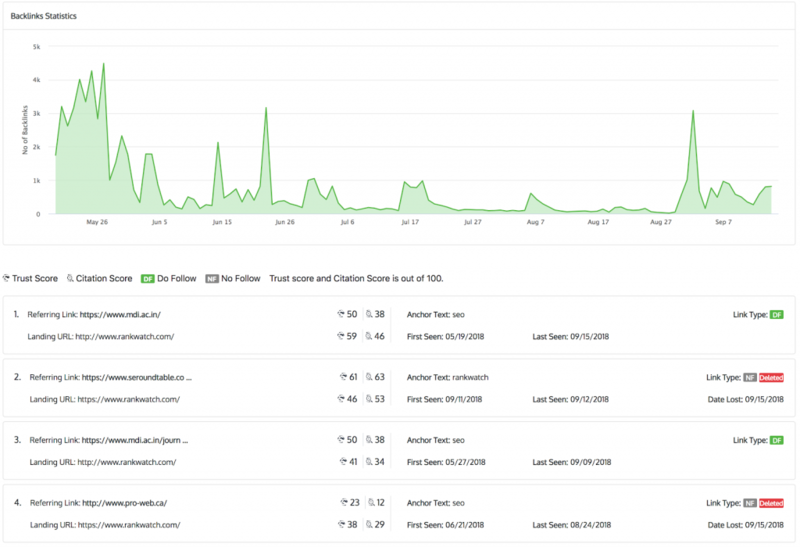 Using such tools to analyze backlinks for a competing webpage on your keyword target can help you develop backlink building leads. Find websites that could use your new article and offer it to them as a means to update their article – which also boosts their visibility by refreshing the content. Your brand, be it a blog or a business, must hold a competitive advantage to develop online traffic. This brings us back to basic marketing strategies. A competitive analysis can help your brand develop a unique quality that your business offers, a differentiation tactic that can be used to build links. The keyword reclamation method mentioned previously can be composed hand-in-hand with your brand resource for backlink building. Maintaining a website can be a lot of work, and pages will “break” every once in a while. This is huge for SEO because no one wants a broken link on their site. Broken links increase bounce rate and push search rankings down, which is harmful to blogs and other websites that are linking to broken pages. 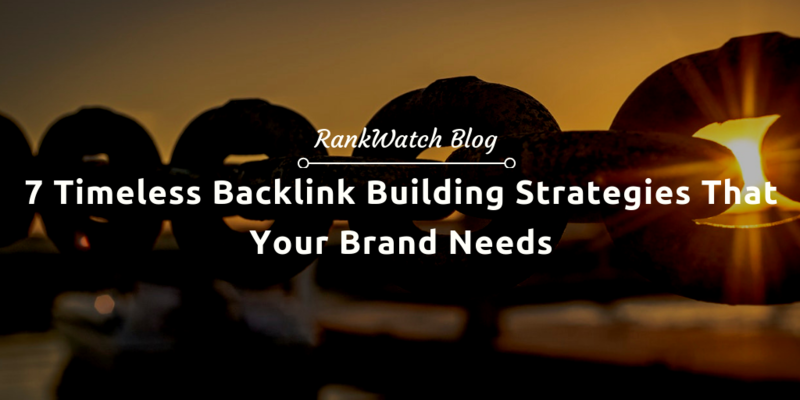 This backlink building strategy is more commonly labelled under broken link building but falls very much in line with the Skyscraper method. You are still scraping easy links from other websites, but this time it’s from broken pages that offer no content and replacing it with your own. Developing content for other websites is a great way to build backlinks. It serves specific advantages that other strategies do not offer. This strategy is best for acquiring links for new domains, by reaching out and offering your quality content on their site, you serve to gain a backlink from a new domain. You can find websites to reach out to through the same lead generation methods the keyword alerts deliver. Websites that are unwilling to link to your current content may be open to a guest post. The best advantage a guest post offers is the anchor text selection. You get to place your links where you want them with specific keywords to your content. Content marketing can (sometimes) be dry. Infographics are another form of content marketing that can be used as a resource for link building. Infographics help visualize information that a writer may be trying to get across. You can build quality infographics with graphic design tools such as Canva or Piktochart. Publish infographics in your content and offer the image as a resource for links in your targeted outreach. 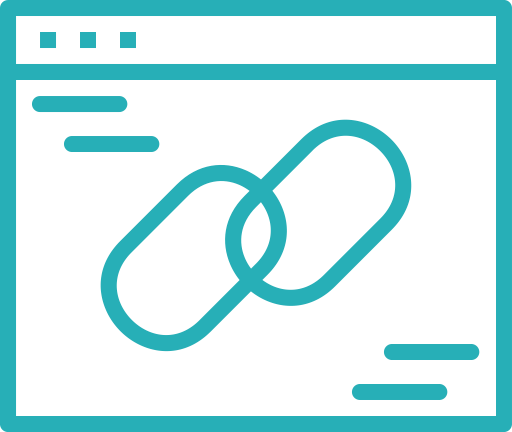 Backlink building techniques like these are extremely important for content marketers because the media offers added value to their website. Infographics can be a bit tricky with links because you don’t want backlinks to your image. Instead, you want backlinks to content that includes your image, so specify this in your outreach and include the targeted link as well. Sticky content, media that catches the reader’s eye, is the key to successful backlink building and infographics offer exactly that. Roundups are clusters of quotes or resources for a specific category or topic. They include information from experts or a list of top articles for a period. This form of content is a two-way street. You can build backlinks with this strategy by producing content, and by using outreach as a method to be included in these articles. The one fault roundups entail is regarding targeted link building. These serve as another form of brand mentions that feed Google juice to your domain. But this strategy might not be a great one for keyword targeting. These 7 strategies are great, scalable ways to produce links for your website and increase brand awareness online. The ultimate goal is to increase organic traffic driven to your site. The above strategies cost less than PPC, or pay-per-click, and produce higher quality results for longer periods of time. Alan is a Content Marketing and SEO Specialist that loves writing about all things tech. Having spent the past couple years in the cold trenches of Fargo, you can find Alan adjusting to the sweltering Chicago heat while waiting for AI and our robot overlords to take over.